Your final PPS project will bring together all of the skills that you have developed over your 2 year career-related programme. The cohort will work with a local foreign language International School to run an ‘Olympic Sports Day’ for a selection of primary students. This day will require all of the transferable skills developed in PPS, your career-related BTEC studies, your service learning and perhaps most importantly….your language development. Students should plan which elements should be completed pre-event, during the event and which elements post-event, students can then organise a timeline accordingly (every event should have a beginning, a middle and an end, ideally leaving a lasting impression). Areas of research & reflection will also be necessary. The final product would be the successful delivery of the event, evidence of participation in the form of photo / video, observation records and witness statements. Also feedback from students, teachers & parents in addition to self reflections from the CP students themselves. Does body language always communicate the same message or can there be different interpretations? (Language-development based, NVC in French culture). Discuss the importance of reading body language and ways to avoid misinterpretations. Discuss the importance of asking questions in this process. (Language-development based, clarification questions in French, key phrase list). What are some examples of nonverbal communication that differ between people of different generations and different cultures? (Language-development based, NVC in French culture). BTEC Art: Work with business on promotional campaign. Face painting? Offer support to all other teams. BTEC Media: Work with sport students to create a website with videos explaining tips, techniques and rules. On the day, live stream to website? Youtube? Provide parents with link? Update website with live results / scores. Audio / MC. BTEC Business: Work with Art on promotional campaign. Organise meetings with FIS and act as our ‘professional body’. Plan for the tuck shop. Run a tuck shop on the day (manage finances). BTEC Sport: Create the videos explaining tips, techniques and rules. Create risk assessments & organise first aid provision. 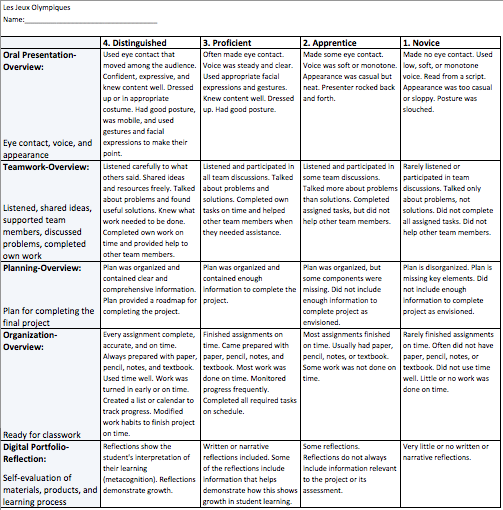 Below is the rubric that your project will be assessed against, you should use this to inform your planning. Evidence will be given back to you via Google Classroom.